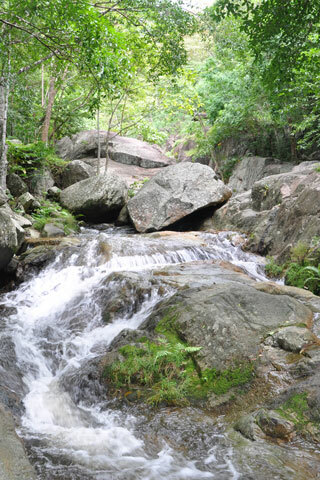 This is Prachuap Khiri Khan’s best regarded national park, and the prime attraction here is, you guessed it, a waterfall -- and it’s a pretty good one. Browse places to stay in Prachuap Khiri Khan on Booking.com. Book Now - Pay Only When You Stay. Huay Yang waterfall is a seven-tier fall and bathing pools are on each level. The pools are packed with small fish like perch, so don’t worry if you feel hairs on your arms and legs being pulled -- piranhas are rare. While the falls have seven tiers, we couldn’t figure out how to get past tier five, which was plenty enough for us. A separate hiking trail heads to a mountain viewpoint, but given it is about 4-5 hours walk (guide recommended) you’d really need to be staying in the park to do this. Apparently from the viewpoint if you walk for another hour you’d be in Burma -- Thailand is very very narrow around here. A variety of national park-style accommodation is available and a small restaurant sells cold drinks and Thai staples on site. Set to the west of highway 4, 29 km from Prachuap Khiri Khan, is the signposted turn off for the national park, and the park entrance is seven kilometres away. While you could conceivably visit here by getting a bus from Prachuap Khiri Khan then heading to the park by motorcycle taxi, that would be a very time consuming way of doing it. Admission for foreigners is 100 baht with a 20 baht surcharge for motorbikes.